What is Brain Fog? Brain Fog is a lay term to describe fluctuating mild memory loss that is inappropriate for a person’s age. It may include forgetfulness, spaciness, confusion, decreased ability to pay attention, an inability to focus, and difficulty in processing information. Remember that gradual cognitive decline from early adulthood is a fact of life. Brain Fog can occur in Sjögren’s, but other factors might cause these symptoms and should be considered by you and your doctor. Always report changes in cognition/memory and mood (depression, anxiety). over 65-70 years of age, a major cause of cognitive dysfunction can be side effects of drugs and drug interactions. Inquire about your hormonal status, thyroid function, and blood pressure. Rejuvenate with sufficient sleep. If after 8-9 hours of sleep you are still tired, tell your doctor. Limit multi-tasking and focus on one task at a time. Manage effectively musculoskeletal and joint pain. Exercise regularly. Adequate physical exercise enhances cognition/memory. stimulating activities and establish new friendships and relationships. Take your body to the gym and don’t forget to visit the “BRAIN SPA” – both will improve brain function. Recent scientific data show that longevity is associated with the successful management of chronic diseases, such as Sjögren’s, not the absence of any disease! Suggested reading: The Memory Bible, by Gary Small, MD, Director of the UCLA Center on Aging, available from the Sjögren’s Syndrome Foundation. ***This information is from the Sjogren's Syndrome Foundation's "Patient Education Sheet: Brain Fog." Click Here to view more Patient Education Sheets from the SSF. 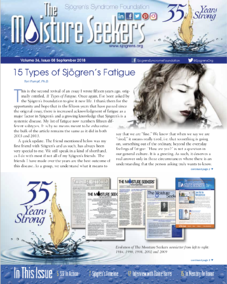 We encourage you to comment below and share what you've found helpful when dealing with Brain Fog & Sjogren's.